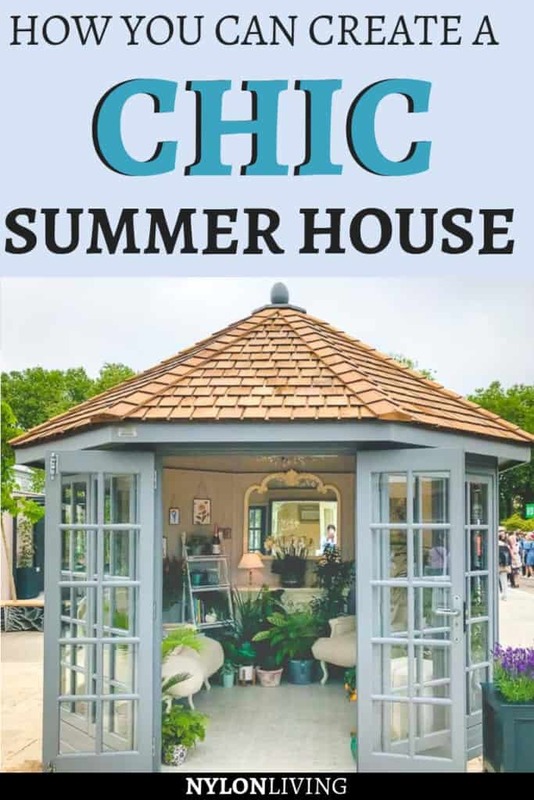 Keep that summer feeling in your outdoor space all year round with an elegant garden summerhouse. The weather is mild enough in the UK that I think garden summerhouses are a great idea for most of the year. Would you like a she shed UK? 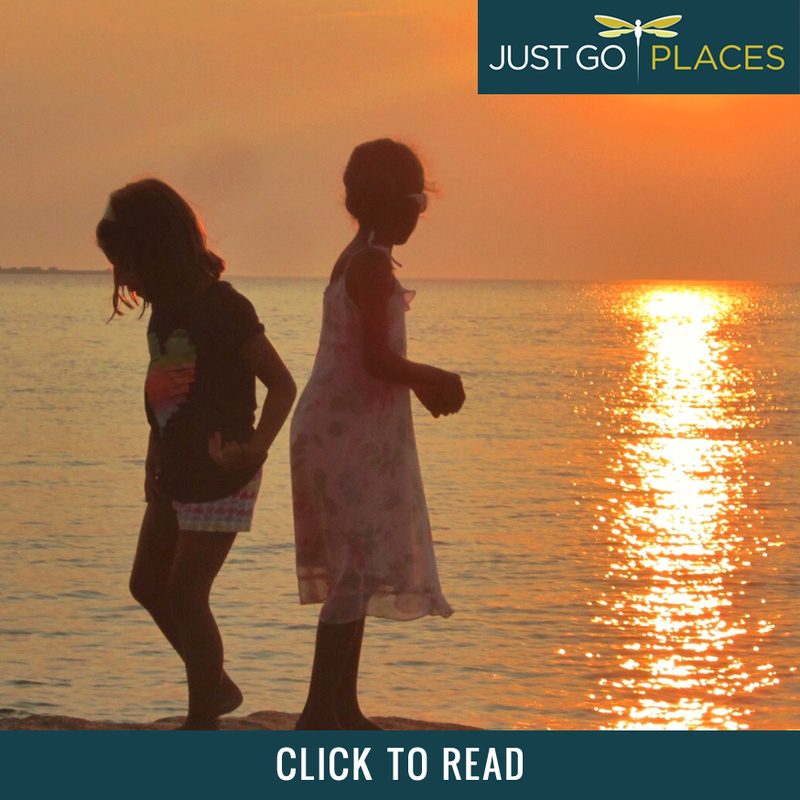 (try saying she shed summerhouses fast for a laugh – I can’t!). 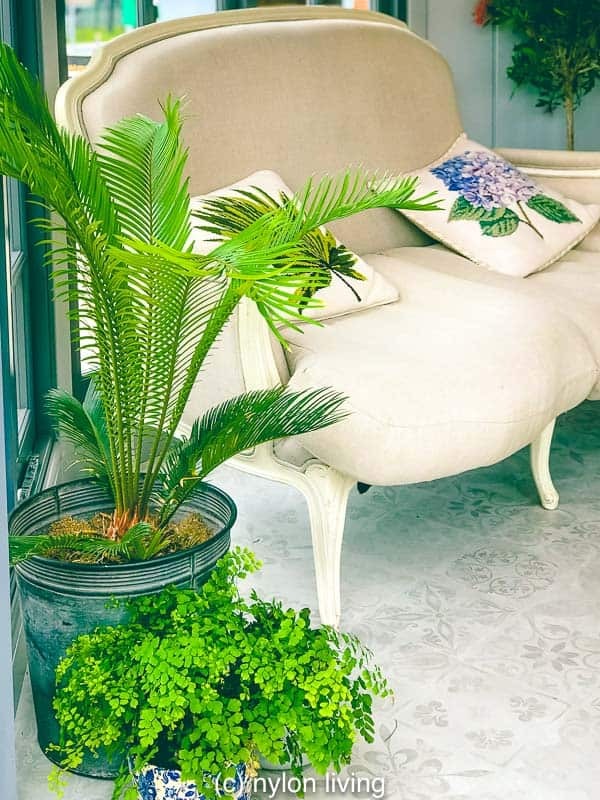 The best of these garden summer house ideas create a space that reminds you of a cozy living indoor space – only surrounded by nature. A summerhouse in the UK doesn’t just have to be just for summer. 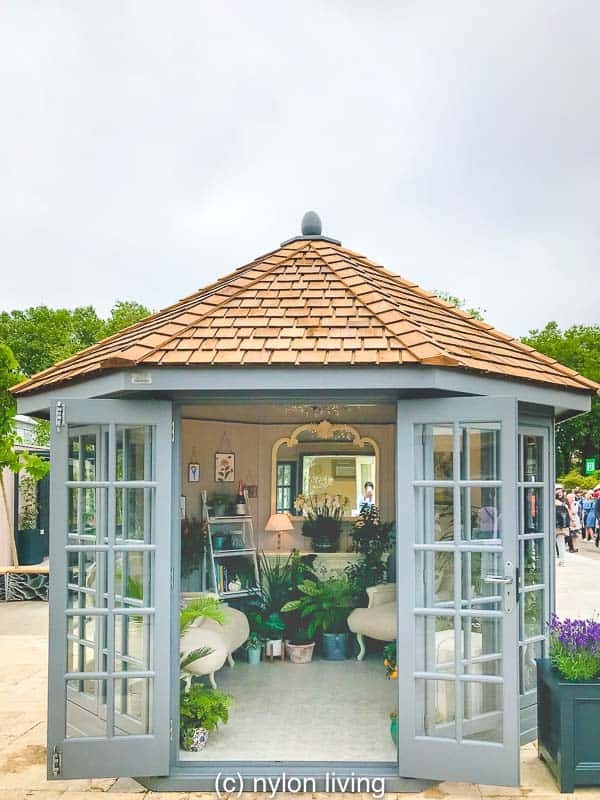 Check out this elegant hexagonal summer house I saw at Chelsea Flower Show 2018. It’s oozing she shed UK style but with French flair. The best of the summerhouses UK were on display at Chelsea and this modern summerhouse was hands-down my favourite. What garden summer house ideas can we steal from this hexagonal summer house? This garden summerhouse is a charming room no matter what time of the year. 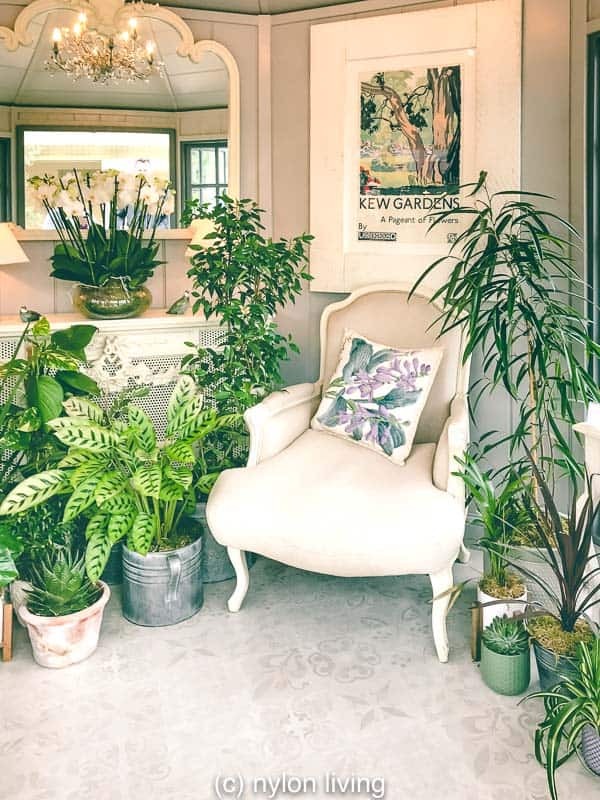 Why not soften up the look of your garden summerhouse with potted plants? 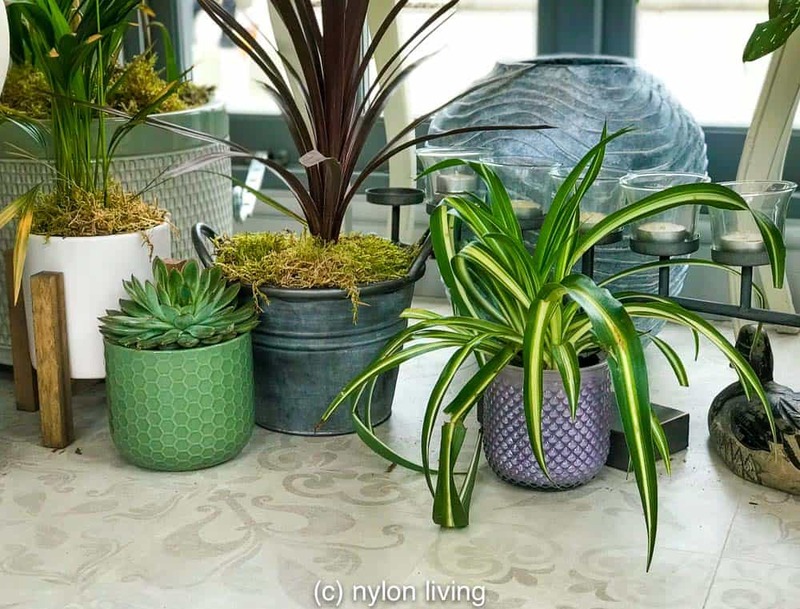 It doesn’t have to cost very much either because Ikea does stylish yet cheap pots and potted plants (included succulents!). 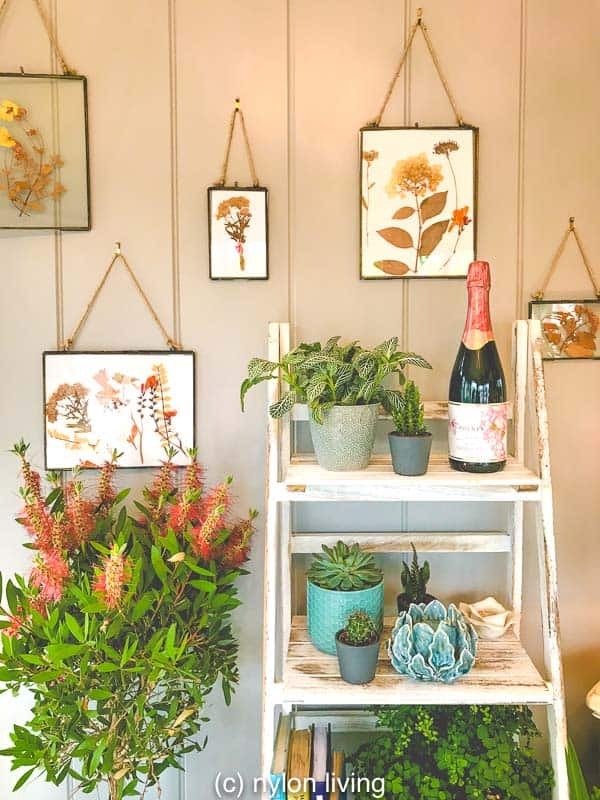 Plants not only add design flair and a jungalow boho feel but keep the air in your garden summerhouse fresher and cleaner. Potted plants add style and charm to your garden summerhouse. I never thought a hexagonal summer house could be suitable for furniture placement just because of the angles of the walls. Check out how great these French-inspired seating looks in this hexagonal summerhouse! A comfortable large sofa for your modern summerhouse. 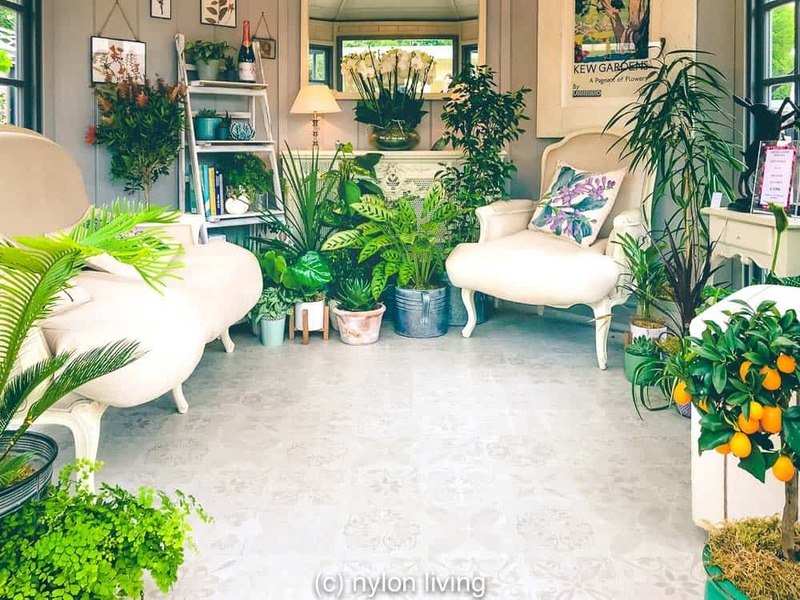 Arrange seating so that you can have a cozy chat with visitors who stop by your she shed in the UK for either a cup of tea or something stronger. 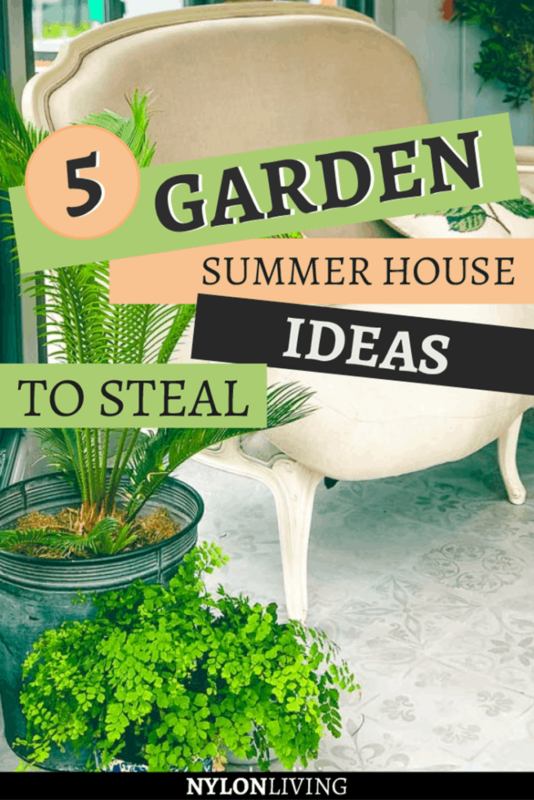 Garden summer house ideas include bringing plants inside to create a cozy hideaway. 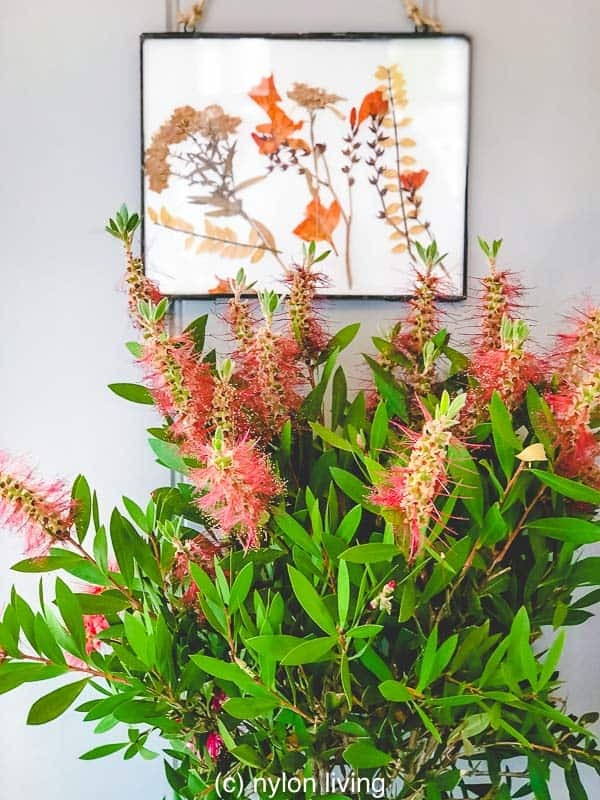 Add artwork and other homey touches to your space. 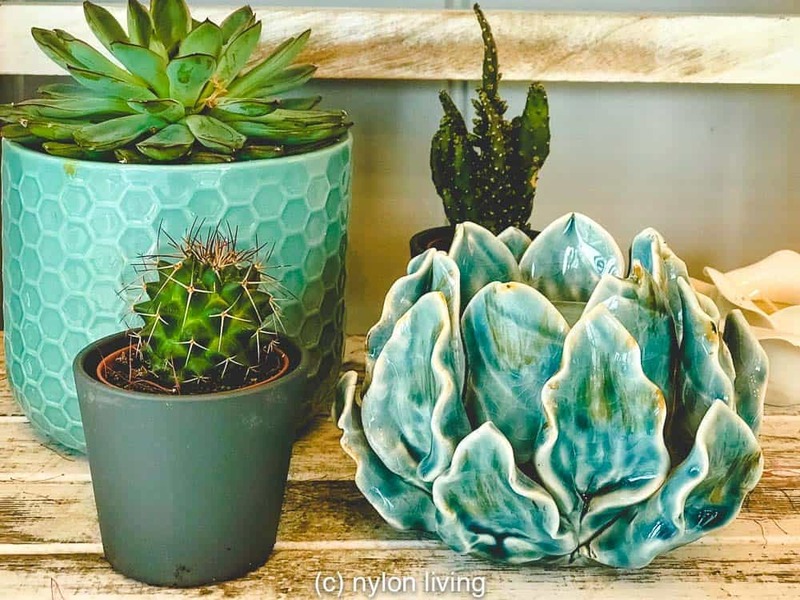 Decorate in a relaxing paint color. The weathered ladder is a perfect touch for displaying objects. And the odd bottle of champagne! 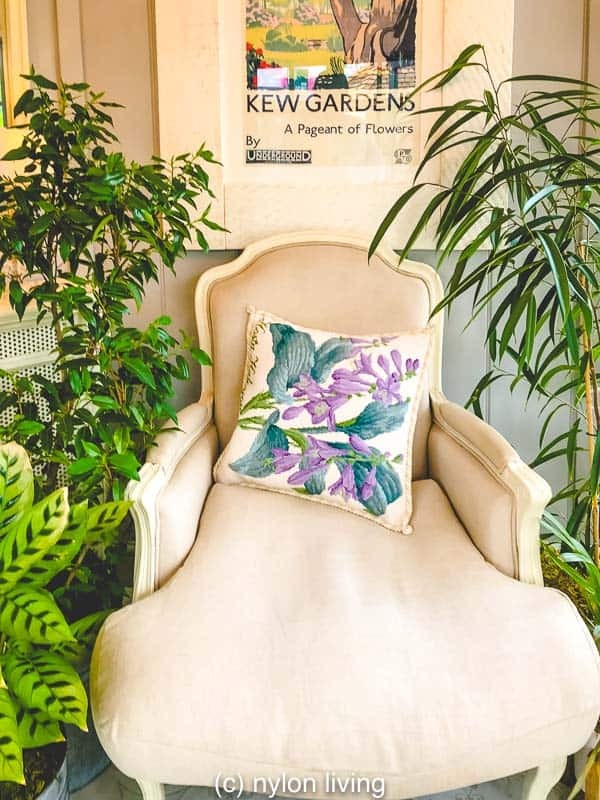 Glam up your modern summerhouse with botanical prints and plants. I love garden summerhouses that merge into the environment they are in. Who needs company in your she shed UK? Can’t you just imagine sinking into this chair with a good book? A comfy chair and a cozy nook is all you need in garden summerhouses to feel a world away from your backyard. Garden summerhouses need good lighting in order to keep them usable in the winters when the light starts failing earlier in the day. 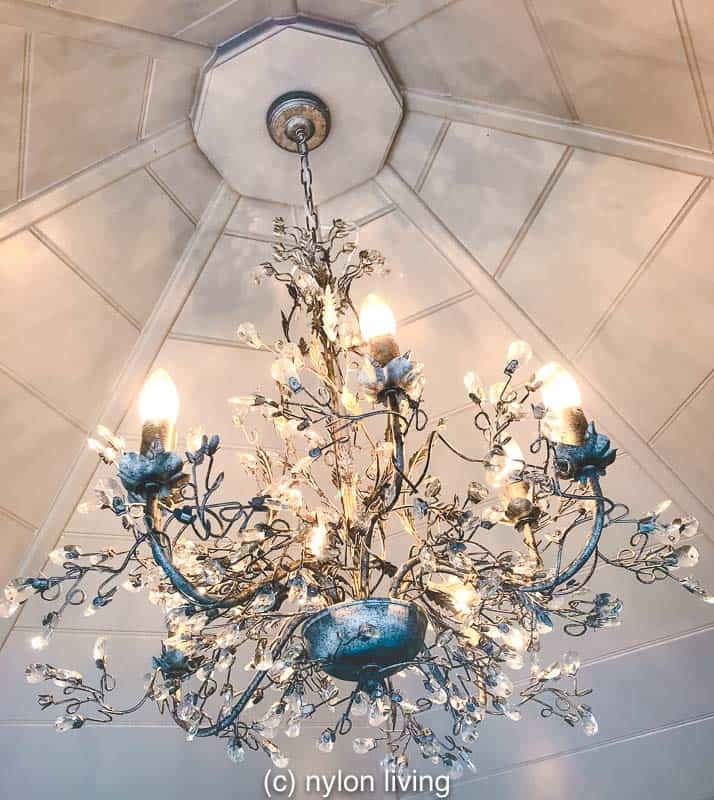 Chandeliers are perfect summerhouse ideas but really show to best effect in a hexagonal summer house or an octagonal summer house because of the roof. A chandelier provides elegant lighting in this hexagonal summer house. SPREAD THE WORD! PIN THIS TO YOUR PINTEREST BOARDS FOR FUTURE REFERENCE! Chelsea Flower Show 2018. It’s oozing she shed UK style but with French flair.